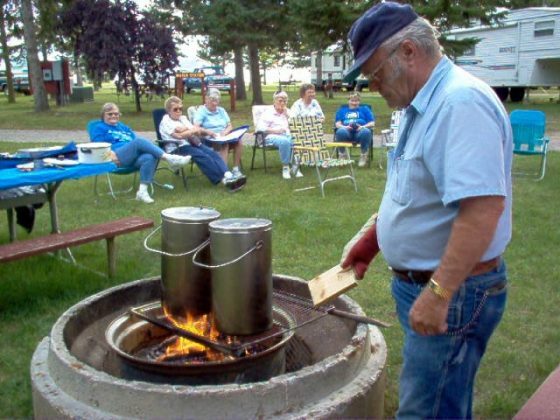 When Dad retired from farming, he & Mom bought a small RV and did some traveling. They joined a group of Good Sam campers and they had a lot of wonderful memories camping over the years. 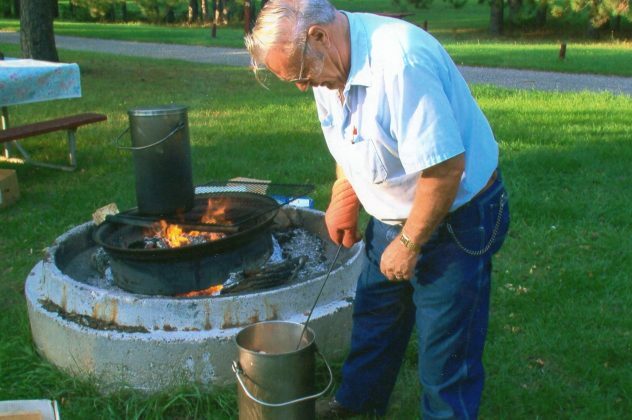 Dad was always in charge of making the HOBO stew—which he made using our 2 stainless steel shotgun cans that we’d used for hauling milk between the milkers & the bulk tank. Later he upgraded to a system where the milk went directly into the tank, but all the years I helped with milking…it was dumping it into the shotgun cans, and then carrying to dump into the bulk tank. Muscles! Here is the recipe as well as some pics of Dad making it. We made this after his Memorial Service. Dad would have been pleased! 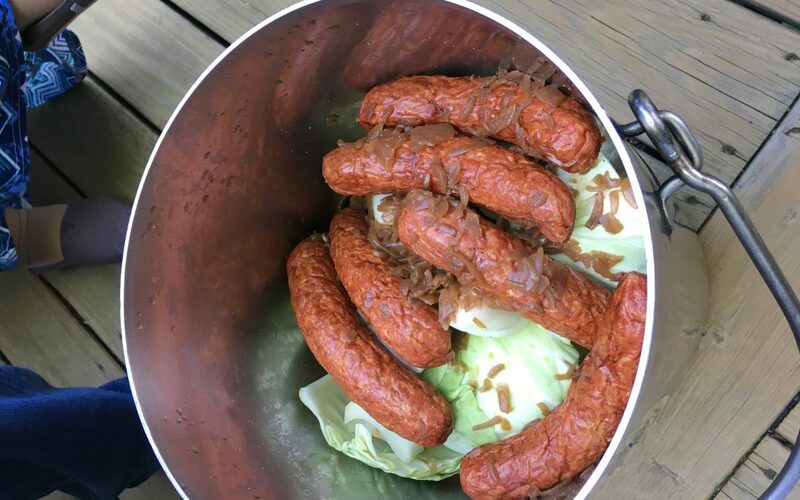 Nice big Bratwurst type sausages – we always get them from our local meat locker. Figure approx 1 sausage per person with a few extras thrown in for good measure! 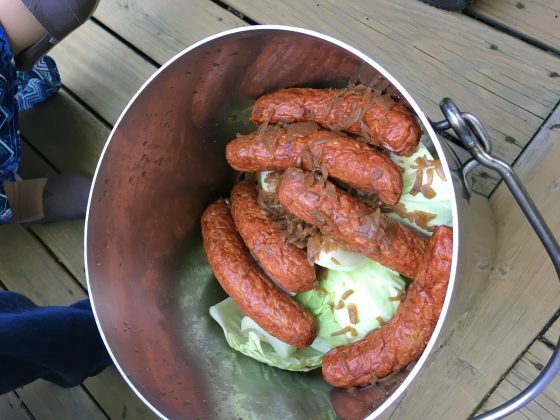 Cover the cans, and set on the campfire or you can use a turkey fryer base. Once there is steam coming out, continue cooking about 20 minutes longer. 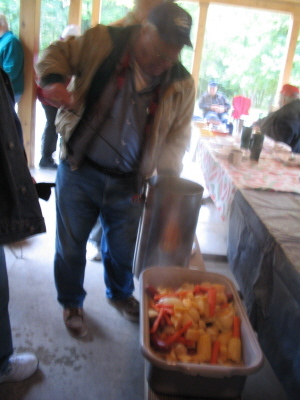 We put the rutabaga, carrots etc at the bottom of the can as they take longer to cook. Ready to cover & go on the fire! The “boss” checking if everything is done! Dumped out & ready to eat! They left the corn & carrots full size–but it takes a bit longer to cook then.